"This salad is wonderful served warm or at room temperature with some French bread and a green salad." Preheat oven to 450 degrees F (230 degrees C). Line a cookie sheet with foil, and spray with non-stick cooking spray. In a medium bowl toss the red bell pepper, yellow bell pepper, eggplant, and squash with 2 tablespoons of the olive oil, salt, and pepper. Arrange on the prepared cookie sheet. Bake vegetables 25 minutes in the preheated oven, tossing occasionally, until lightly browned. In a large pot of salted boiling water, cook pasta 10 to 12 minutes, until al dente, and drain. Drain the softened sun-dried tomatoes and reserve the water. 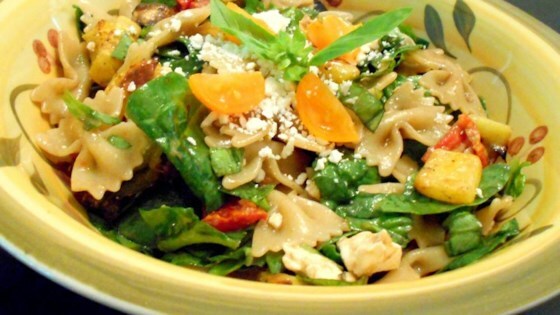 In a large bowl, toss together the roasted vegetables, cooked pasta, sun-drained tomatoes, arugula, and basil. Mix in remaining olive oil, reserved water from tomatoes, balsamic vinegar, garlic, and feta cheese; toss to coat. Season with salt and pepper to taste. Serve immediately, or refrigerate until chilled. I FOUND THIS DISH TO BE VERY BLAND. AND IT TOOK ME QUIT AWHILE TO MAKE. I WON'T MAKE THIS AGAIN.